Have you faced challenges trying to arrange playdates for your child with special needs? Do you want to help your child establish new friendships, but don't know where to start? "Special Playdate" is here to help! Among the biggest everyday challenges faced by special needs parents is something that parents of typical children may take for granted - the playdate. How do you find the right peer for a playdate? how do you facilitate the playdate - what is too much and what is too little? How do you communicate with the other child's parent? Thanks to Jane Hsu, there is now help and guidance. Jane, a special education teacher in the NYC public schools, founded SpecialPlaydate.com in 2010. On September 27, she will offer advice and practical tips to help make playdates more successful and will discuss how Special Playdate can help if you need extra support and guidance. 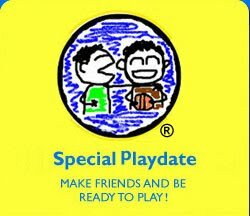 Special Playdate offers a FREE and EASY way to get started in arranging successful playdates for your special needs child. It’s an online service connecting parents with other parents seeking playdate opportunities for their children with special needs. Members are able to securely search for appropriate peers in their local communities and can also use the private message system to connect with other parents, before scheduling a playdate or revealing personal information. Special Playdate's expert clinicians also strive to offer you ongoing benefits - from weekly playdate tips to ongoing workshops and social skills-building programs. Let Special Playdate be that first step towards creating a lasting friendship for your child. Jane Hsu received her MA Degree in Education from New York University in 2006 and has worked in Special Education for the past 5 years. During this time, she became acutely aware of how difficult it is for children with special needs to make friends, establish rapport with other children, and develop appropriate social and communication skills. Finding no good solutions to this problem, she decided in 2008 to save up her money to begin SpecialPlaydate.com, an online matching service to help parents nationwide to find nearby playdates for their special-needs child. While majoring in Public and Community Service as an undergraduate at the University of Massachusetts, Jane worked at the League School of Boston, a residential program for adolescent males with autistic spectrum disorders. She also worked at the Day Development & Transition Center in Cambridge, a nonprofit organization offering pre-vocational training to people with developmental disabilities. After graduation, Jane worked as a Vocational Resource Specialist at Work Opportunities Unlimited, an employment and training organization helping people with disabilities to find jobs. She also worked as a Bilingual Chinese/English Employment Specialist and Career Counselor the Jewish Vocational Service Center for Careers and Lifelong Learning in Boston. Born in Taipei, Taiwan, Jane immigrated to the United States with her family at the age of four. She presently works as a Special Education Teacher in Chinatown and lives in New York City.